If you’re going to take a trophy buck, you have to know a trophy buck lives on the property you hunt. The quickest and easiest way to learn whether or not you have a trophy buck on the land you hunt is to go to the property as soon after bucks shed their antlers as possible. Search, like a detective looking for clues, for shed antlers. Regardless of how elusive a trophy buck is, each year he has to shed his antlers. If you can find those antlers, you can know there is a trophy buck on the property you hunt. A second method of determining whether or not you have a trophy buck on the property you hunt is talking to the landowners. Often in farming and cattle country where landowners spend a lot of time on their lands, they will see big bucks. If you ask them, they may tell you about the bucks they see, how big they are and, where they’re seeing them. The third technique to use to learn if you have a big buck on the property is to look for rubs on big trees that are higher off the ground than the rubs on small trees. Generally, but not always, big bucks rub big trees and rub higher up on trees than small bucks do. The fourth method, which is probably the quickest and easiest and provides the most information, is using the new automatic cameras with motion detectors. Wherever you set up those cameras, you can photograph the deer – day and night. Automatic cameras are most-effectively used to record deer movement close to home, so you can change the film and look at the pictures regularly. I’ve used automatic cameras on the ranches I own, lease and hunt since these cameras were first introduced to the marketplace. I’m a gadget person. I’ll try any new gadget as soon as it comes to the market to try and determine if it can help me hunt better and more effectively and bag whitetails in a more-efficient manner. Right now, I’m using the automatic Moultrie Game Cam. One of the reasons I believe the automatic camera is one of the most-effective tools to find a trophy buck on your property is because most hunters don’t have a tremendous amount of time to scout. The advantage the automatic camera offers is that it can scout for you 24 hours a day, 365 days a year. One of the reasons I particularly like the Moultrie Game Cam is because it’s inexpensive enough for a hunter to purchase more than one and scout several areas at the same time on the property he hunts. I suggest you set these cameras out at watering locations and feeding sites, along prominent trails, on scrapes, rub lines, or trails leading to bedding areas. Since a lot of deer activity takes place at night, these cameras can scout for you while you sleep. Without question, I believe the automatic camera is one of the greatest scouting tools to come out in the last 10 years. If you’re going to take a trophy buck on the property you hunt, you have to know the property you hunt homes a trophy buck. You must define the trophy bucks’ home range. Once you know you have a trophy buck on the property you hunt, you have to learn where the trophy buck feeds, beds and has his rub lines and scrapes. This information tells you how and where your trophy buck is traveling on your property. Once you know what the buck’s home range is and what his lifestyle patterns are, you are ready to start selecting tree-stand sites to give you the maximum opportunity to harvest that trophy buck. The time of the year you hunt the trophy buck determines where and how you select your tree-stand sites because once you know where the buck lives you have to try and determine where you can set up a tree stand to take that buck during daylight hours. For instance, on an agricultural field, you may look for tree-stand sites just inside the wood line off the field. A trail that leads from the food to the bedding area in the early season is a highly-productive place for your tree stand. If you’re planning an evening hunt, look for tree-stand sites along the trail the buck takes from his bedding to his feeding site. However, trophy-buck hunting isn’t this simple, or else a hunter will take a trophy buck every time he goes hunting. Remember that a trophy buck will rarely use the same trail day after day. Bucks often have several different trails they utilize, and you never know which trail the buck will take on the day you’re hunting. However, this system is the best I know of to maximize your odds of seeing and being able to bag your big buck. Because a trophy buck has so many trails from which to choose, the automatic cameras will help you get the best indication of which trails your trophy buck uses most frequently. And herein lies one of the true values of using automatic cameras for scouting for trophy bucks. Now that you know you have a trophy buck on the property and have pinpointed which trails he is using and the area he is frequenting, you have to put in time in the woods. The number of hours spent in the woods has a direct correlation to the number of trophy bucks taken. If you only have two days on the weekends to hunt, then you need to stay in your stand from before daylight until after dark on each of those two days. If you live close to where you hunt, you may have the luxury of being able to hunt in the mornings before you work and the evenings after you work. During the rut, I’ll take my daughter to school and then go to my stand about 9:00 a.m. and stay until 1:00 p.m. I also vary the times I go to the stands and the stands I visit, not going to the same stand every day. Some days, when my wife takes the children to school, I’ll hunt the early morning until about mid-day, then come in, do office work and return to the stand about 3:00 p.m. Regardless of how much time you have, use that time in the tree stand to wait on a deer. Many hunters ask me, “Jack, how do you spend that much time in the woods hunting deer and not leave so much human odor that you spook the bucks you’re trying to take?” I do everything possible to eliminate human odor. I bathe in odor-killing soaps before I hunt. I wear scent blocker suits, and I take advantage of all the odor preventatives on the market today. However, I realize I still leave human odor when I go into the woods. You can’t totally eliminate human odor from the hunting environment. But I try to get rid of as much human odor as possible. To solve the problem of a trophy buck’s smelling me, I make sure that I go to a stand that will allow me to hunt downwind of the buck I’m trying to take. You can hunt the same general area for the same trophy buck every day, as long as each day you hunt, you make sure you hunt from a stand downwind from where you expect the buck to come. If I have no stand sites that allow me to hunt downwind of the trophy buck I’m trying to take, then I won’t hunt that day. All hunters are concerned about not spooking a trophy buck. However, what hunters must be concerned with is not spooking any of the other deer in the area the trophy buck may see. For instance, if you spook an alpha doe, and she begins to blow, if the trophy buck you haven’t spotted sees or hears her, you have just spooked him. For this reason, on my property of 1,800 acres, I have about 120 tree-stand locations from which I can hunt. I’ve developed those places over the past 11 years. I’ve tried to learn the movement patterns of the bucks on this property. As I learn, I store the information and mark the spots as tree stand sites. My rule of thumb is to try and have 10 to 12 tree-stand sites where I believe I can take a particular buck. So, if I believe I have four trophy bucks on my property, I should have at least 48 stands from which to hunt those four bucks. Now that you have your tree-stand sites selected, think about when you see a trophy buck come by the tree stand and how you plan to get a good shot at him. For this reason, once I’ve picked my tree-stand sites, I begin to cut and maintain shooting lanes. I believe shooting lanes are one of the most-overlooked aspects of successful trophy-buck hunting. Many hunters believe that if they disturb the woods by cutting shooting lanes they will spook the trophy buck they hope to take. I don’t believe in this philosophy. If you’ve done all your scouting and preparation work but haven’t cut shooting lanes, you may miss the opportunity to take a trophy buck because you can’t get your shot off. Therefore, I believe cutting shooting lanes is a must for successful trophy-buck hunting. The most-critical factor in cutting shooting lanes is to maintain them. The trails the deer use year after year will always be there, regardless if you have a rain storm blowing down trees or a change in the land-use pattern. So, cut your shooting lanes the week or two after deer season is over. In September, well before hunting season, go back into the woods, and clean those shooting lanes, cutting any limbs or brush that may have grown up in those shooting lanes prior to hunting season. Learning to use rattling antlers and deer calls is especially important if you are a bowhunter. Remember that whether you are rattling or using other deer-call devices, no form of deer calling always works. But, when deer calling works, it can make the difference in taking or not taking a trophy buck. I have learned that rattling antlers and blowing deer calls have two different effects on trophy bucks. When I use rattling antlers to call in bucks, the sound of the antlers evokes a very emotional, excited, nervous response in the bucks I am trying to take. When I use grunt calls, bleat calls and many of the vocalization sounds deer make, generally, the deer will become more calm. Certain forms of calls produce better than others at specific times, places and situations. I’ve learned just about any buck coming to rattling antlers will be looking for a fight. He’s afraid he’s going to be attacked by the animals involved in a fight already. So the deer that comes to rattling antlers is very nervous, very excited and looking for a reason to leave. I believe when you use rattling antlers, the deer is much like a fox or coyote coming in to a predator call. If a buck is 300 yards away and you start rattling, I think the buck knows exactly where you are, except on real windy days. He’ll come straight to your location once he hears the antlers. I can’t tell you how many times I’ve rattled to bucks 200-300 yards away and had the bucks come in and stand directly under my stand. Last year, I rattled in a buck while bow hunting. The buck stopped behind a tree about 45-yards away from my stand. As I watched the buck with my binoculars, I could see that he was very, very interested until he got to that tree. When he began to look and couldn’t see any other deer, his expression and demeanor changed as though he where ashamed to even be there. I think this buck knew he had been fooled, and he very quietly turned around and slipped back into the woods. I’ve been in very few places where rattling has spooked a buck. But, I’ve also hunted ranches before where rattling is used so much and so often that when a buck hears antlers rattling, he’ll turn and run the other way. Bucks can get rattling-wise. I believe grunt calls and other forms of deer vocalization cause bucks to come in not jazzed-up. When you’re hunting with a bow, you’ll often have to rush your shot, and more than likely you can expect the buck to duck the arrow. But, when you are calling in a deer using deer vocalization, you usually have more time to shoot because the deer is less likely to jump the string. I wait until the deer puts his head behind a tree or his head down to eat something off the forest floor before I draw. If the buck turns and looks the opposite way from me, I’ll draw. You need to know when you’re ready to draw that the bow isn’t going to make a sound. If your arrow falls off the rest, it should land on moleskin, so it’s silent. My arrow rest and shelf are all covered in moleskin. I oil my cables and wheels with vegetable oil so they won’t make a sound. I have had several trophy bucks get away from me because they’ve heard me when I’ve drawn my bow. So, before you go into the woods, make sure that your bow produces absolutely no sound when you draw. Many times you can tell from the way your stand is set up that when the buck gets within 20 yards there’s a clear forest floor between you and him. Then more than likely the buck will see you when you draw your bow if you wait for him to move within 20 yards of you. So, you need to be prepared to draw your bow and hold it when the buck is out at 40 to 50 yards. I practice so that I know I can hold my bow for at least 5 minutes and still get off the shot. One of the tricks I’ve learned is to lock my thumb behind my neck as an anchor point when I’m aiming. By using my thumb to lock the arm that draws the bow, as fatigue sets in, the opposite arm that is holding the bow is not the arm holding the string. I can effectively shoot for up to three minutes after I’ve drawn the bow. If you can shoot accurately at 40 yards, and you are deadly accurate at 30 yards, but you wait for the buck to come within 20 yards to take the shot, I think you’re making a big mistake. If you can group arrows well at 40 yards and have a buck at 40 yards, take the shot. Don’t wait for him to come within 20 yards. The longer you wait to take the shot, the greater the odds the buck will spook, and you won’t get the shot. If you’re in the right position in your tree stand to take the shot, and the buck is inside your effective range, don’t wait on the perfect shot. Take the shot the deer offers you. 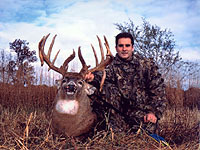 Many times there is only a small window of time, 10-15 seconds, when a trophy buck will be within your effective range. If you don’t take the shot, any number of things could go wrong. If the deer is walking within my effective range, I’ll make one attempt to stop that deer before I take the shot. I will usually give a bleat call or a grunt call with my mouth to stop the deer before I take the shot. After the shot, I immediately try and determine where I’ve hit the buck. Then I follow the buck with my eyes and try and pick out a real good landmark at the spot where I’ve last seen the buck. The shot dictates how long I stay in the tree before I start following the deer. If I can see a blood trail without binoculars from my tree stand, and I know my shot has been in the heart/lung area, I get down immediately and start blood trailing the deer. When I can see that much massive blood loss, there is no reason to stay in the tree. If I’m not sure about where the arrow has hit, I’ll wait 15-20 minutes before I come down out of the tree and start blood trailing, depending on how much light is left in the day. When I begin blood trailing the deer, I assume the animal is still alive until I find its corpse. For this reason, I move very slowly and very quietly while blood trailing. If I’ve missed the deer completely, and I don’t think the deer has smelled me, I will hunt the deer from the same stand the next day. If a deer takes off after a shot but doesn’t know what has caused the noise, then there’s no reason for him not to come back to that spot the next day. Trees and limbs fall in the woods all the time. Squirrels drop acorns, and pine cones fall. So, unless the deer knows and understands what has spooked him, I believe he will return to the same location. In fact, I hunted a big buck I had wounded this year from the same stand where I wounded him. When I wounded the deer, I was fairly certain the shot I made wasn’t fatal. He could have been gored by another deer he didn’t see or hit by a limb. There are a lot of other reasons deer get hurt other than being shot by a gun or a bow. If the deer doesn’t know a hunter has hurt him, he may return to the same area at a later time during hunting season. I think we often spook the trophy bucks we’re trying to take when going to and coming away from our stands. I always go to my stand and leave my stand so no deer in the area is not spooked by me, even if I have to set up my stand on the edge of an opening. I believe that any deer you spook going to and leaving your stand negatively affects the area where you’re hunting a trophy buck. I also believe that if a big mature buck sees another deer running away from the direction of your stand site one or two times, then that trophy buck knows something is spooking the deer. He will change his movement patterns. If I’m hunting near a food source or in a spot where I know there are other deer around, I will howl like a coyote to spook the deer naturally rather than spook the deer when they see me coming out of the stand. Howling doesn’t always spook the deer out of the field, but it does most of the time. When deer see a human climbing out of a tree stand, they’ll be spooked out of that region for several days. If you can’t howl like a coyote, buy a commercial coyote howler, and use it. Another tactic, which works just as effectively, is to get someone else to take you to your stand or pick you up from your stand either on a four-wheeler or by car and stay close to your stand with the motor running until you get in your stand. I don’t believe deer are as spooked by the sight of vehicles as they are by a man coming out of a stand. When they come back, they leave the motor running until I get out of the stand and in the car or on the four-wheeler with them. By using a vehicle to take me to and from my stand, I also have the smell of the vehicle masking my human odor and I’m not leaving nearly the amount of human odor in the woods I will if I’m walking. The other advantage of getting dropped off and picked up at your tree stand is the safety element. Most tree-stand accidents happen either climbing up or climbing down in a stand. By waiting on your buddy to pull up under your stand, before you start to come out of your stand, you have help available if and when you ever need it.